It must have been tough to be on the grounds crew last night. A game was lost, but fireworks show went on as advertised. 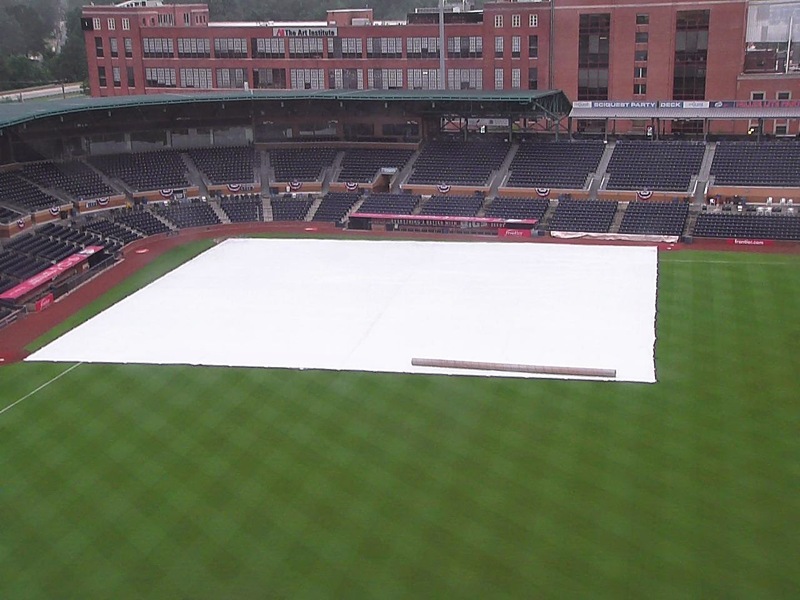 So they had to fix the field and spread the tarp because it looked like rain (and it did). Must have been 1 o’clock in the morning after a long, long losing game. But it looks like they got the job done early this morning. Thank you! Merrill Kelly is up tonight. One more trek back to the DBAP. Here’s hoping the weather holds and the Bulls come back. Last chance. One of the links mentions that very thing re Mahtook. Lots of woulda, coulda, shoulda's, last night. I had meetings this morning and really didn't feel like writing about it. Here's hoping weather lets them play tonight. Mine too. That's how it played out last year up in Pawtucket with long game 3, easy game 4 for the Bulls. Going to be difficult to turn it around. What if Karns had started for the Bulls instead of the Rays last night? But the apparent lack of confidence in Stowell thus far (he's been up throwing a few times, but we rather let a tired Thompson pitch the 13th) means there's probably more to the story than even that. Maybe he's limited to 1? I realize it's game 5, so maybe Liberatore can pitch an inning and maybe the Rays could authorize Colome inning, but I'm not hopeful in either. I think you've just about nailed it. Cory Burns only threw 18 pitches, but not sure he's up to back-to-back. I think radio said that Romero wasn't available either. But their guy has no AAA experience at all. Could be a mess on both sides. Well you can only hide the league's worst BA for so long. Good season though. That's so. And DRR called it re being flat after losing a long, tough game. Outpitched. Outhit. But agree that it was a good season and fun at the park. Didn't like what renovations did to my seats, though. And ended up not liking location I moved to. Will have to try a new place next year. I have some good/bad/ugly thoughts on the team, renovations and broadcasting that I'll share later this week.